Recently published Real Estate Institute of New Zealand (REINZ) statistics confirm what we are seeing in the marketplace: it has been a cautious and subdued spring rural property market. Several factors are contributing, with dairy sector uncertainty the most apparent. Compared to the previous 12 months, in the year to September 2018, dairy property transactions were down by 8.4 per cent. 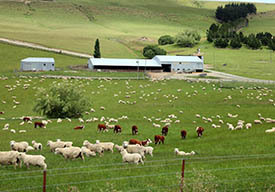 In the same period REINZ’s median price for dairy property fell by 18 per cent while the nationwide dairy farm price index, which accounts for differences in farm size and location, fell by 15 per cent. Although this trend is less apparent in some regions, most other statistics indicate a similar softening in dairy property. Plenty of dairy properties are on the market nationwide. Although there is interest, buyers have yet to demonstrate any great commitment or urgency to secure these. At the upper end of the dairy sector, for farms exceeding 250 hectares, with comprehensive infrastructure to support a larger herd and more intensive inputs, new overseas investment rules have taken a significant proportion of potential buyers out of the market. Properties with these specifications have not sold in recent years for less than $12 million. Those with sufficient equity to purchase in this price bracket have substantially reduced in number and are now restricted to local interests only. With less buyers, for the New Zealand-based purchasers who remain, reduced competition has eliminated any pressure to buy. Lack of buyer enthusiasm has flowed through to the market for smaller dairy properties. Meanwhile, the sector remains wary of Mycoplasma bovis. Investing in dairy land while the industry is still coming to grips with this significant risk would take considerable conviction. Elsewhere in New Zealand agriculture, plenty of positives remain. Meat schedules are strong; relative to most of our trading partners the dollar is encouraging for our primary produce exports; interest rates show no sign of shifting from historical lows; and global demand for our horticulture underpins sustained optimism in that sector. Despite the uncertainties outlined above, a payout forecast of $6.50 means a profitable season is even in prospect for most dairy farmers. Despite that, and some high-quality listings, the spring rural property market has not resulted in as many sales as might have been expected. Whenever any market experiences a subdued period such as this one, it is generally due to a mismatch of price expectations between buyers and sellers. Eventually the market will react to the more obvious signals, value expectations on both sides will come into line, and sales will proceed. With many excellent properties on the market, across all sectors, and some of the most prominent of those likely to sell before Christmas, that should happen in the next few weeks. If you require further guidance on the evolving rural property market, my colleagues at your local branch of PGG Wrightson Real Estate are standing by to assist, and are ideally placed to help you achieve your business objectives, with professional, impartial, expert advice.